very surprize to the quality of this ornament, very detailed! I can not wait for christmas to hang it on the tree! Love this airplane ornament. Purchased as a gift for my granddaughter. I was able to personalize the airplane (she's going to visit family in Las Vegas this spring) so we put 2016 Vegas and it's all ready for early gift this coming Zchristmas time. Colors were great, printing looks great for personalization, great buy for the money and a unique keepsake to remember her upcoming trip. Loved it! I had searched a long time for an airplane ornament that actually looked like a plane and this was it. My daughters first year as a Flight Attendant. Perfect gift. The ornament was perfect for my client's childrens Christmas tree . [...]Dad has a plane!" My grandson said it is the most beautiful airplane ornament ever. airplane to treasure for a lifetime! I purchased this for someone who dreams of becoming an airline pilot =) It will be a nice little stocking stuffer surprise. This little airplane will be a cute remembrance piece for our grandchildren's' upcoming plane trip. It will accompany a book on taking a plane trip. It is bright, well made, sturdy, and personalized with with the year and destination state name. They can hang it each year on their Christmas tree. Very pleased with purchase. Know someone who flies a lot? Know someone who wants to be in the aeronautic field? How about sending it with an invitation to come visit? Really unique. This ornament made such a cute and unique Christmas gift! It turned out exactly how the picture illustrated. I couldn't have asked for anything better! I LOVED THE AIRPLANE AND THE CRUISE SHIP ORNAMENT..
WE GAVE THE AIRPLANE AND CRUISE SHIP ORNAMENT TO OUR GRANDKIDS AND SURPRISED THEM FOR A FAMILY VACATION ONE WEEK BEFORE LEAVING. I STILL CAN'T BELIEVE I ORDERED AND RECEIVED ALL IN ONE WEEK PERSONALIZED BESIDES .IT WAS PERFECT. I WOULD DEFINITELY RECOMMEND MILES KIMBALL. This is an ornament for my Christmas Tree. It embraces memories, memories of my trips to my home country. My only con is that the airplanes should depict colors of the national flight- for eg. they should be more like a mini scale f the real plane. My son got married this year so i got the plane with the year and the name of the Island they honeymooned at. What a great way to commemorate their trip! Every year they hang it on their tree, it will bring back all those happy memories. I WOULD GIVE THIS PRODUCT TO ANYONE. CHLOE OUR 10 YEAR OLD GRANDDAUGHTER IS CRAZY ABOUT PLANES. HER DAD TRAVIS , IS A JET MECHANIC & SHE LOVES PLANES. WE THOUGHT THIS WOULD BE A NEAT ORNAMENT . CHLOE LOVED IT. We love this ornament! We bought it to celebrate our 2010 trip to China to adopt our little daughter this past February. It is now on our Christmas tree, and our daughter loves looking at it! We used this ornament to commemorate and remember our honeymoon to Las Vegas. This is a great little ornament to give to someone to remind them at the holidays of a great trip you took this year! Our granddaughter visited us during spring break from MSU. She'll always remember her flight and the sunshine state. I highly recommend this airplane ornament. It is a clever way to commemorate a special family trip. I bought one for my son's family also. Bought the airplane to be used as a Christmas tree ornament. Very satisfied with it. We personalized it by using our wedding year and our names for each other. Looked very good with our Hallmark airplane ornaments. Since we live in Florida, it reminded us of the shuttle when put on the tree. The attention to detail on this ornament was amazing! And, this little "airplane" says we're goin' to Disney World! It is a wonderful, lasting memory for our Christmas Tree! I got this ornament for my boyfriend who is long distance. I love that it was personalized, and it was much better quality than expected. 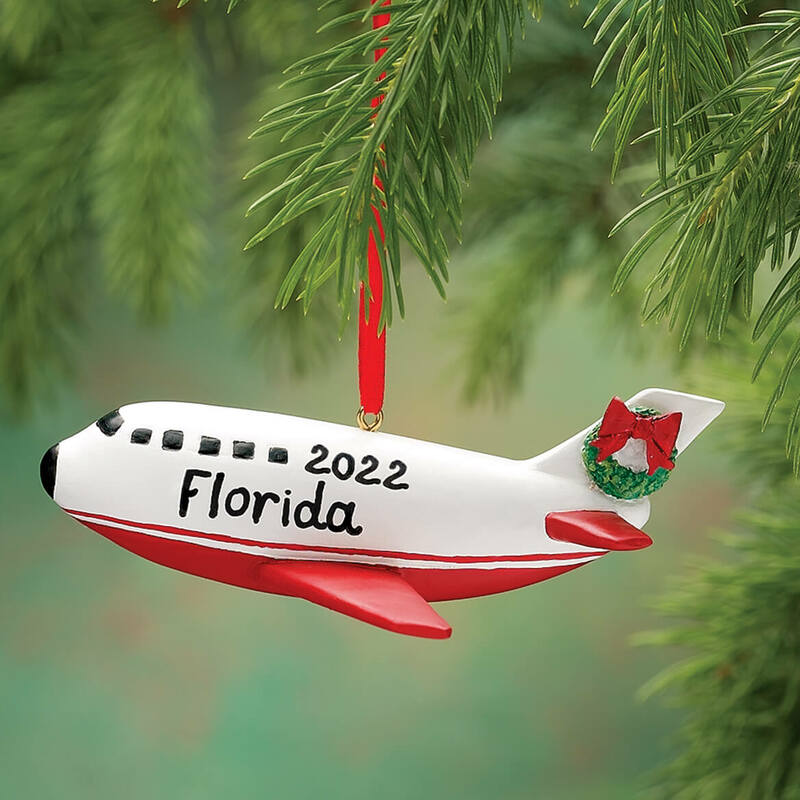 Was great ornament gift as I buy a ornament for my kids each year to symbolize something from that year and this year they took their first airplane ride! This ornament turned out perfectly! Bought it to commemorate my daughter's first flight. Very cute, looks handmade. My husband is a recent graduate as an A & P Mechanic. That's the guys who work on planes. 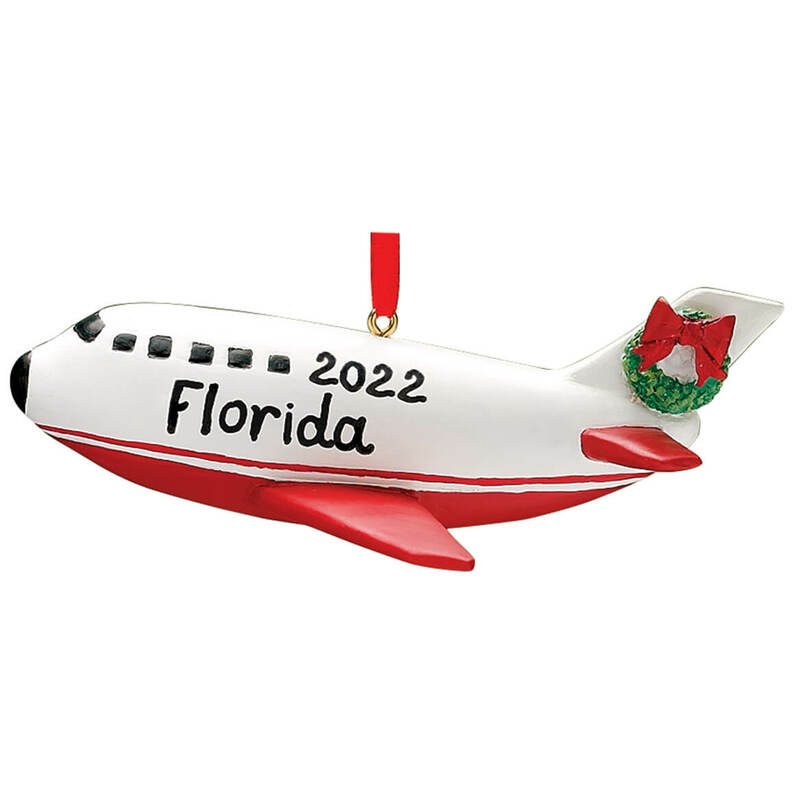 When I saw the little plane ornament that could be personalized, I was thrilled. I had the name of his school and date of his graduation added to the little plane. It is in his Christmas stocking waiting for Christmas. I love the unique little treasures that I can find in Miles Kimball catalogues. I really liked the ornament. The problem was that my grandson had already gone home before the package came. Purchased as a gift for friend that has everything else. I have been getting these for my granddaughter for the past 4 years to commemorate our vacations together. She loves them and they remind her of our good times. I sent it to my daughter 2000 miles away so I never saw it. Personalized ornament for my Grandchilds first flight. It's ok but not unique. I thought both sides would be personalized but one side was left blank. I personalized the blank side but not as neatly. I would recommend to a friend if unable to find one locally. The 1st one you sent me was very, very bad, paint was off color and not in line, there was a chunk out of the side of the airplane, I called and you sent me a second one, not much better then the first 0ne , I bought this item for a child and it looks like it was painted by a child, there seems to be little quality control wherever this was done, not happy at all. tHIS IS NOT WHAT I PUT ON IT! We use the airplane ornaments for Christmas time reminiscing about our trips. wanted an ornament for my daughter that spent a semester abroad in New Zealand to remember the first airplane ride she ever took. Perfect ornament for a special trip. My daughter and I will be taking our 1st cruise and flying to Florida to board the ship. An ornament to remember that trip to come. First flight - wish I could have entered the wedding date instead of just the year though. Purchased this item two previous times. Jace is flying to France and England this year. We took a family vacation this year, and this was the perfect ornament to commemorate the trip. Granddaughters in one of the families had their 1st flight this year. Thank you! Perfect for my grandkids first trip in an airplane and to Orlando! bought for my daughter. It is the first time she has flown!! Love my airplane ornament. I ordered it jus for me. I move to Wisconsin from Pennsylvania and my first time flying. A souvenir and ornament for year round use. For my granddaughter to remember the year we went on a trip to Disney World in Florida. Took family vacation to Hawaii this year. to celebrate my granddaughters graduation trip . My daughter is going on a vacation to Chicago this year... this will be also be a reminder to her when she went. Children are traveling and it is a nice reminder of their vacations. I ordered them last year and the kids were delighted when they received them. Friend took trip this year. Took our first family trip on airplane. My husband flew planes that looked like this- we went to Bermuda for our honeymoon. taking a grandchild to California and wanted as a remembrance of the year! I reflect back to what a family member did that was a big highlight of their year and personalize it. can i personalize year but no location? BEST ANSWER: Ok this is too funny they have a satisfied customer answering your question! I did the airplane with Nicaragua 2014 and it was sooo cute and well made. i would assume you could just do date, but why not the person's last name OR the word THE WORLD or maybe THE U.S. enjoy ! You can personalize both the date and place on the air plane. I ordered one this year and one last year. Great way to remember a special trip. Both planes were great gifts to give. I put a name, year, and location on the ones I ordered. They are beautiful and the children love them! I want to put a heart between my son and daughter in laws name. How do I do this? BEST ANSWER: Thank you for your question. We are unable to personalize with any special characters such as the ?. We hope this information will be of help to you. 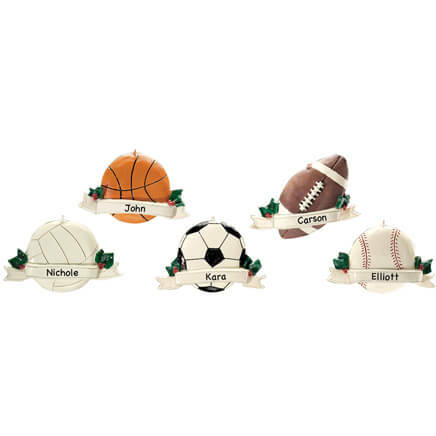 Do you do personalized Retirement Ornaments? I'm looking for a female adult. BEST ANSWER: Thank you for your question. Unfortunately we do not carry an actual retirement ornament.